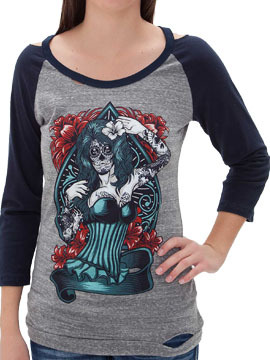 Secret Artist Society Naughty women's long sleeve scoop neck tri-blend henley t-shirt features a tattooed woman with sugar skull make-up wearing a corset with flowers in the background. Open back and shoulder creates a modern and updated look. 100% cotton, light weight, slim fit. Garment dyed with silicon wash for soft feel. Color: heather grey with black sleeves.